Choosing the right color for your wood floor is a big decision. After all, once your floor is complete you don’t want to have to go through the process of refinishing for a VERY long time. When thinking about this decision you might only be focused on design and color. But in this Flooring 101 post, we are going to compare light floors to dark floors not only in terms of how they work with the overall design but also how they compare with respect to maintenance and cleaning. 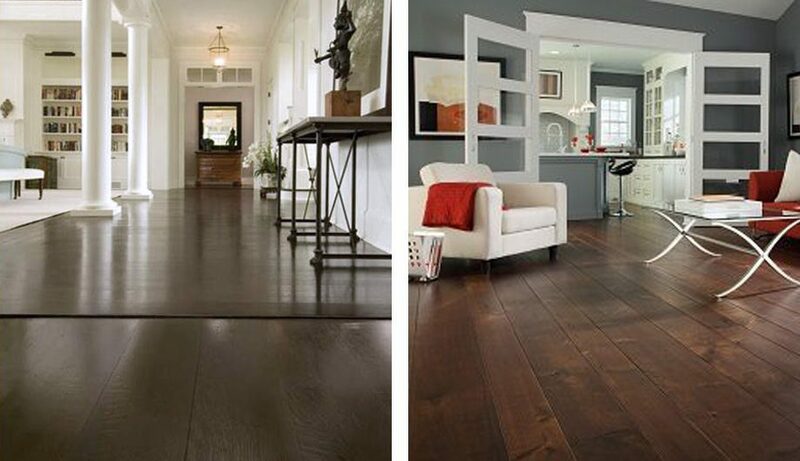 Dark wood floors are on trend and have been for quite some time now. Whether it is an old plantation style home in Virginia with the original heart pine floors aged to a rich brown patina or a newly constructed New York Penthouse, dark wood floors are a favorite! Dark wood flooring works great with a variety of colors and fabrics whether you want a varied color pallet with modern furniture and fabrics, or a mix of soft beige and earth tones with rustic wood furniture, linen, and leather. You can combine your dark wood floor with a variety of colors. This makes it very versatile! As you can see from the photos, you can also use this style floor to create a formal look or one that is more rustic and casual. 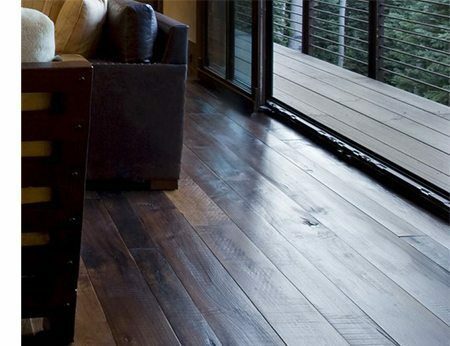 Many people think dark wood flooring looks formal, but that is not the case. In fact, many floor designs include a dark stain to make the floor look more aged and antique. For example, the Heart Pine floor featured here is finished with a dark stain and has an antique look to it, like it was recovered from an old home. There are many ways to create a dark wood floor. You can use a naturally dark wood like Cherry or walnut flooring, or you can use a natural light floor like pine or oak, and use a dark stain! This allows you more flexibility in choosing the wood species. Hickory, for example, is less expensive than Walnut hardwood floors, so if you can create the right look and save money, why not! Everyone has different personal preferences for how clean, and how often they need to clean their floors. Some people are also more sensitive to the appearance of “wear” over the life of their floor. If you have dogs, children, or a generally busy house you want to expect to see more dirt, dust, and debris on a more regular basis. Depending on your personal preference you might be inclined to clean more frequently. 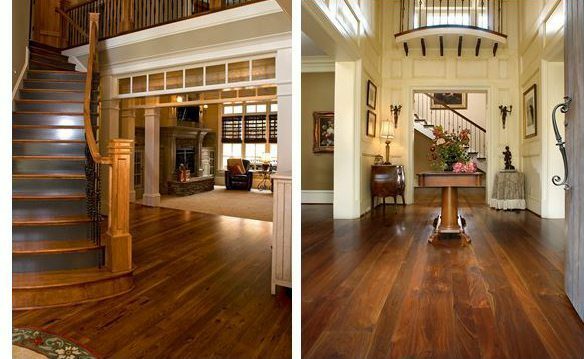 Over time all wood floors accumulate scratches or scuff marks on traffic, shoes, pets, etc. This is very normal and can’t be prevented no matter finish you put on the floor, but depending on your preference you may want to touch up the finish on your floor more regularly. The good news is this wear is normally only located in the surface of the finish, not necessarily in the wood. So if you are considering a dark wood floor, a prefinished wood floor is a great way to go, and make sure it has an easy touch-up process…like the Carlisle Custom coat prefinished flooring, which you can touch up without even having to sand the floor! If you are considering a dark wood floor there are two areas where you may not want to use them. One is in very small rooms, especially if they aren’t connected to the rest of a space. This is because dark wood floors can make a room look small. If you do use a dark wood floor don’t use anything narrower than an 8″ wide board. The wider board will create fewer seams, which will balance out the dark color of the floor. Learn more about the Wide Plank Difference. Another time you may want to reconsider using dark wood floors is if you are running them adjacent to very dark woodwork, like cabinets. Some people are very sensitive to color matching, and if you have Walnut cabinets and Walnut floors the colors may not match up. Sometimes, with a dark wood floor, it is better to create a contrast, rather than try to match. Light wood floors, like maple hardwood flooring, are very common. You might think “gym floor” or the strip oak floors that graced so many homes over the last 30 years. Light wood floors present many design solutions for your interior. They create an impression of space and provide a light palette that you can build off from to create a variety of looks. Floors with a white finish go with almost everything. A light burlap-like color is a great choice because you still get a light floor, without installing a truly “white” floor. You can use a variety of wood species to create a light floor. Oak and Maple are probably the most popular, but there are other styles you can consider too, such as Ash or Hickory. Depending on how “light” you actually want to go, it can be a challenge to create a light finish. 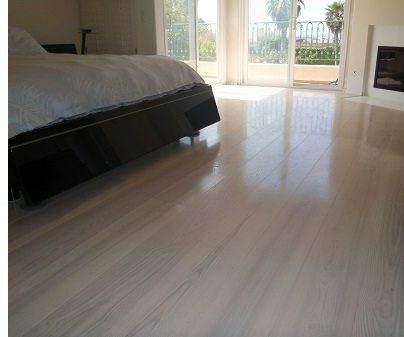 For example, in this home in Southampton, New York, the floor required a coat of stain, paint and a custom sealer to create such a rich white color. The finish you choose for your floor will be important to maintaining the right look. For example, “clear” finishes are going to give a floor like Eastern White Pine or Maple a more “white” look, but if you finish these floors with an oiled based finish they will turn yellow. There are not many situations where a light wood floor would be unsuitable. Some people may be concerned with cleaning and maintenance. You may actually find that with light wood floors it is harder to see the dust and debris — that can be good and bad. When it comes to maintenance, if you apply the right sealer, the floor should be easy to clean and maintain regardless of spills that might occur or dirt that might get tracked in. There are dozens of finish choices for your floor so find an experienced manufacturer who understands wood, stains, finishes, and color so you can be ensured the best results. 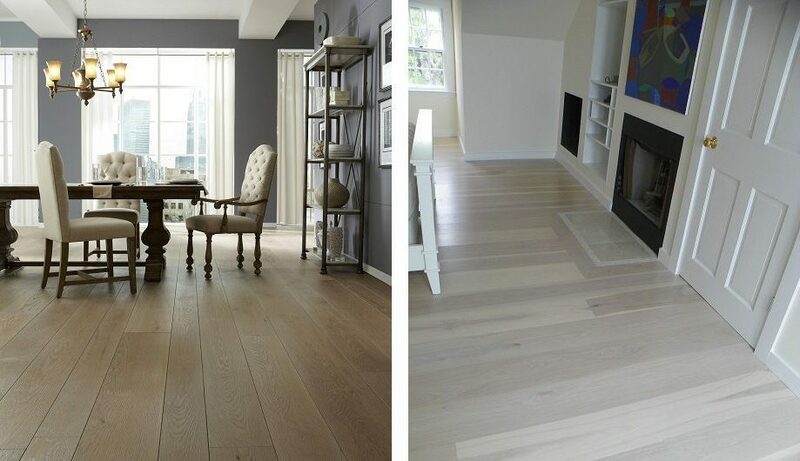 From luxury homes to commercial interiors, browse an extensive collection of the wide plank flooring that we have designed and crafted for clients all over the world. Find inspiration then save it to your own personal library of images to share for further design exploration and planning.